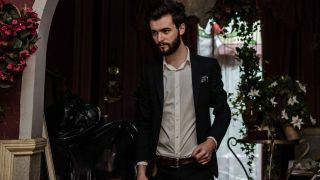 Recalling the likes of Jeff Buckley, Queen and Radiohead, Leeds alt-rocker Charlie Barnes' debut album, More Stately Mansions, is ambitious, melancholy and triumphant in equal measure. "My first guitar was a nylon-string acoustic for my 6th or 7th birthday. I told my parents that I wanted to be like Brian May! Barring the Jack Daniels guitar strap they got for me (which I still use, by the way), I don't think they quite got the fact that I wanted to play loud, heavy rock music. Or maybe they did…"
"My cheap-as-you-like, but also rare as hen's teeth, but also modified way beyond its original price tag, Yamaha Pacifica 311MS. It was my first decent electric guitar and nothing will ever come close to it for comfort. "I've put some insanely loud pickups in it so it's actually quite difficult to work with depending on what you're going for, but I love it. It was my number one on the More Stately Mansions record and my number two on the road with Bastille. There's still more I'd like to do to it!" "When I was at university, I sold my DigiTech Whammy to fund picking up my first Loopstation. It didn't take me long to realise I'd made a huge mistake getting rid of it, so I've since picked up another and it will never, ever, ever leave my hands again!" "I've been treating myself to a few new pedals recently: the Strymon Timeline and a Line 6 M5 to help my continuing pursuit of making my guitar sound like a spaceship. There are a couple more bits and pieces I'll be getting for the 'board ahead of my next run with Bastille, but the main thing on the list is a new guitar. Probably a Strat or a Jazzmaster." "Most of it! I never really learned how to play solos properly. By the time I picked up an electric guitar in my teens, I'd gone off the whole widdly-diddly virtuoso thing and was more interested in weird sound effects and fruity-sounding chords. "I've done my stint as a wedding guitarist, and it isn't half tough trying to get through one of those gigs relying solely on ridiculous tremolo picking and feedback!" "Wailing in falsetto and jumping around like a fish out of water." "Probably still jumping around like a fish out of water!" "I've had laptop crashes and laptops go flying off their stands before - those have all been fairly cataclysmically defeating. "However, more recently, through no fault of anybody, my bass tuner at a Bastille show was calibrated to be exactly one semitone down from standard pitch - that didn't half give me a panic attack. I carried on playing, assuming that I'd either suffered some sort of major brain malfunction and couldn't hear pitch any more, or our sound engineer would spot it immediately (he did), and turn it off (he did)." "Don't play so hard with your strumming hand. I only learned the problems that can lead to when we were recording More Stately Mansions! I have Steve [Durose, producer] to thank for the pointer there…"
Charlie Barnes tours the UK in October.